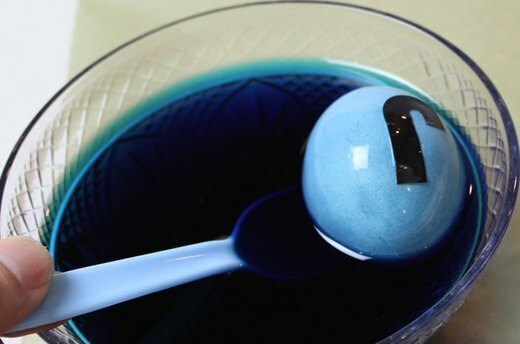 Dyeing eggs with food coloring is an Easter activity we’ve enjoyed since childhood. 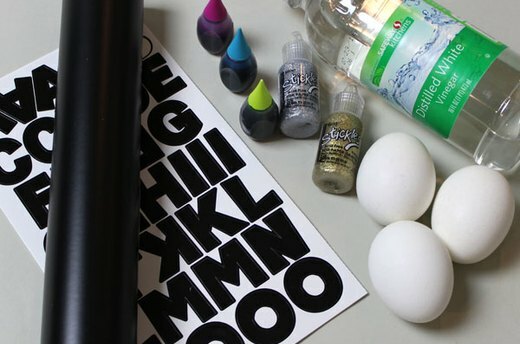 Now, take your egg decorating to a new level of creativity with vinyl stencils. 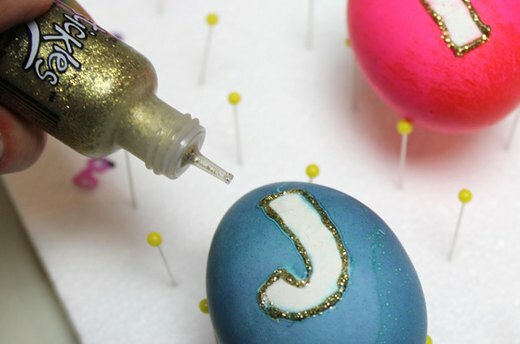 The vinyl shapes resist the dye, allowing you to add designs like monograms and silhouettes to your eggs. Finally, some glitter further accentuates the designs while adding festive sparkle. 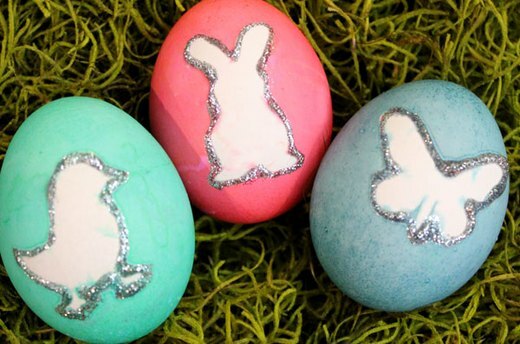 In addition to hard boiled eggs, you will need some food coloring, white vinegar, craft vinyl (either pre-cut shapes or plain rolls that you can cut designs from), and some glitter glue. Glitter glue, which conveniently mixes the glitter and glue for you, comes in a squeeze bottle for easy application. 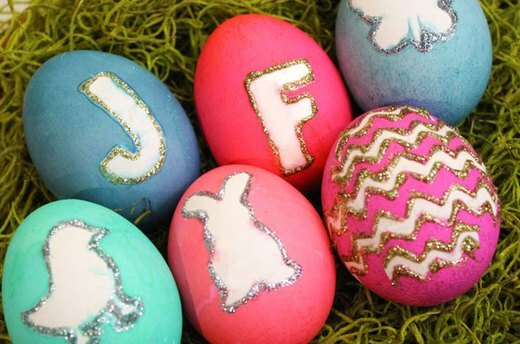 To make monogram eggs, start with vinyl alphabet stickers, which are available at craft stores. Peel the stickers from their protective backing and apply to the eggs. Make sure that the vinyl is adhered securely to the egg by rubbing your fingers along the edges. It also helps if the egg is warm or at room temperature. 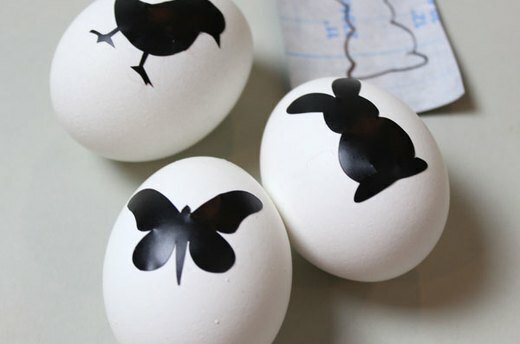 To create eggs with animal silhouettes, draw simple shapes on the back of a piece of vinyl and cut out the shape. Then peel the vinyl from its backing and apply it to the egg. Not all vinyl is created equal. Contact paper is not very sticky and can peel off in the dye bath. Vinyl that is used for die cutting, which you can find at the die cutting section of the craft store, adheres much better to the egg. Draw zigzags on the back of a piece of vinyl and cut out the shape. Peel the zigzags from its backing and apply them in rows on the egg. 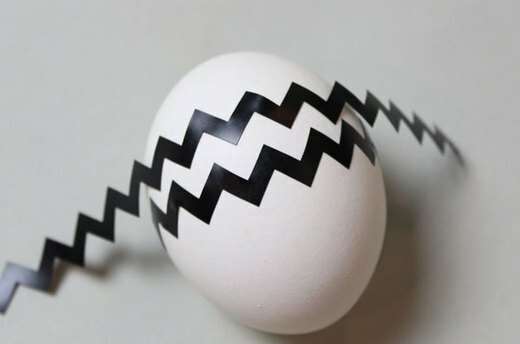 Because of the curve of the egg, it is very difficult to go all the way around the egg with the chevron pattern. Just decorate the front of the egg. Mix a cup of warm water with about 20 drops of food coloring and a teaspoon of vinegar. Drop the egg in the dye bath and let it soak for about five minutes for a light color, and 15 minutes for a more intense color. Remove the eggs with tongs and let them dry. You can either set them on a paper towel or a drying rack. To make your own drying rack, insert a grid of roundhead pins, spaced about one inch apart, into a piece of Styrofoam. 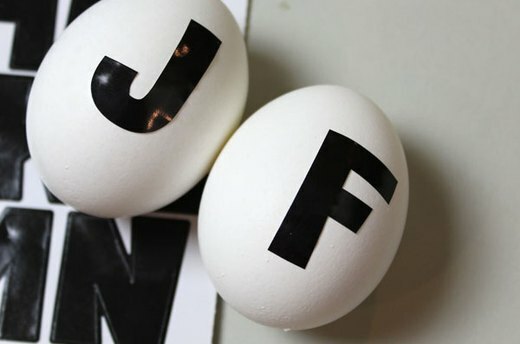 Remove the vinyl from the eggs to reveal your designs. To give your shapes added dimension, outline the edges with some glitter glue. Let the glitter glue dry for several hours. These animal silhouette eggs are made using the same process as the monogram eggs. The animals add whimsy to the eggs, and their white shapes contrast nicely with the bright colors. The glitter outlining the edges of the chevron really makes the design pop. 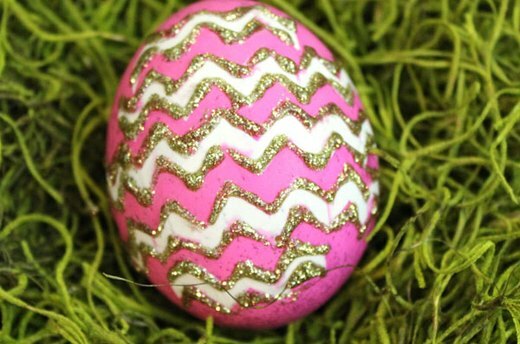 Do keep in mind that the glitter is not food safe, so these eggs are for decorative purposes only. 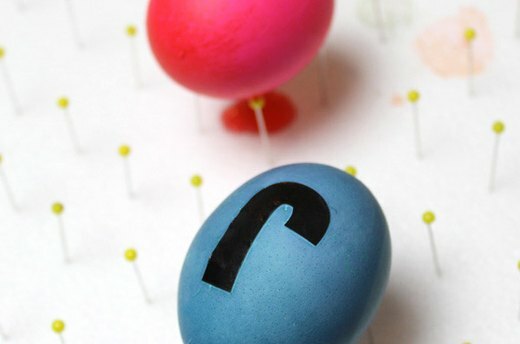 As you can see, stencils let you be even more creative with your Easter eggs. All you need is some vinyl – and a little imagination.